As soon as you receive a lead from the Facebook advertising campaign, after a while (less than a minute) the contact will appear in your SenPulse address book. The application does not use any more data. To enable integration, just select the Facebook Page on which you have enabled an advertising campaign. 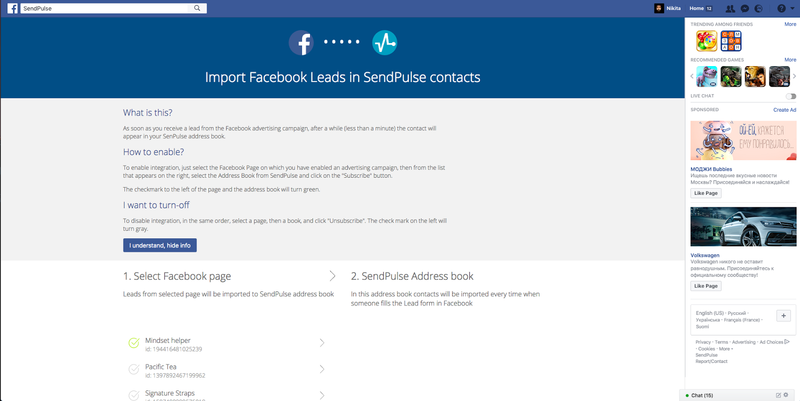 Then from the list that appears on the right, select the Address Book from SendPulse and click on the "Subscribe" button. The checkmark to the left of the page and the address book will turn green. To disable integration, in the same order, select a page, then a book, and click "Unsubscribe". The check mark on the left will turn gray.